This most important of rooms can be the hardest to plan, because it needs to combine a variety of functions – storage, cooking, and eating – and cram in a range of appliances, too. It’s wonderful, of course, to stock a completely new kitchen, but simple changes to an existing layout can make a big difference to its smooth running. A kitchen has four key functions and they need to be planned carefully so you can work in your kitchen safely and efficiently: storage, food preparation, cooking, and living space. Even if you aren’t considering re-decorating it, how you want to use your kitchen is probably the most important factor in planning. A keen pastry cook will want plenty of worktops and storage space for equipment. If you just use your kitchen for heating frozen foods and eating breakfast, then you may want to create space that is comfortable enough to welcome friends for coffee. Parents with small children may care most about non-slip flooring and ample refrigerator space. Don’t clutter worktops, especially those near the sink that are most useful for food preparation. 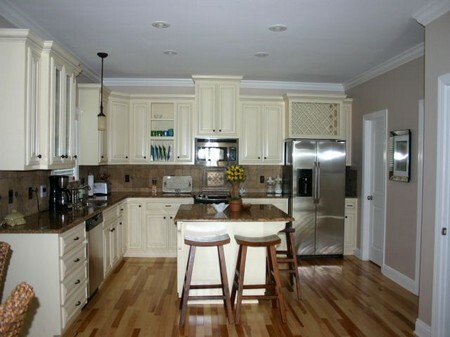 Most kitchens need all available surfaces to prepare a full meal. Cluttered worktops are unhygienic because you’ll be tempted to clean them less often. A wooden cutting board that fits over the sink creates extra worktop space. Consider making space for two rubbish bins, so that you can use one for waste and one for recycling. If possible, locate your cooker hob, oven, and microwave away from the main traffic in the kitchen. This will reduce the risk of colliding with someone while carrying hot pots and pans. Also make sure there is plenty of space in the cooking area for setting down hot dishes. A microwave does not get hot, so it’s fine to locate it next to the refrigerator. Better organization of the oven and cooker hob means using your cooker more efficiently. In a small kitchen, using the oven more and the rings less will reduce steam and smells. Plan the seating to reflect how the kitchen is used. Don’t cramp the kitchen with a large table, if all you do is eat breakfast there. Install a wall-mounted, fold-down table instead, and store the large one in a convenient place, ready for entertaining. If your kitchen is really tiny, you could convert a shallow drawer into a pull-out table strip. Look for kits in kitchen shops. Other space-saving devices include tables with gate legs which fold down on each side, to leave a narrow rectangle on top, and extending tables, which hide an extra leaf under the main table. Stools will mean you can fit in extra people around the table, and they are easy to stack and store when not in use. Removing the kitchen door may make more room, for example to fit in a table, but you won’t be able to shut out noise from the rest of your home or contain cooking smells. Locate the second living area as far away from the cooker as you can. A low-hanging light over the table, which can be worked with a dimmer switch, will create the right atmosphere for relaxing and entertaining.